Until yesterday, I always thought this historic site was named Grand Central Station. Yesterday however was it’s 100th Anniversary and I learned that it’s correct name is Grand Central Terminal. It’s one of the most photographed sites in America and I usually don’t like to post photos that I’ve taken that are also common photos. In this case I’ll make an exception because I did do some things to set this photo apart from many like it. First of all I used a slow shutter speed so that moving figures in the scene would blur, showing the sense of motion that is a part of this scene. 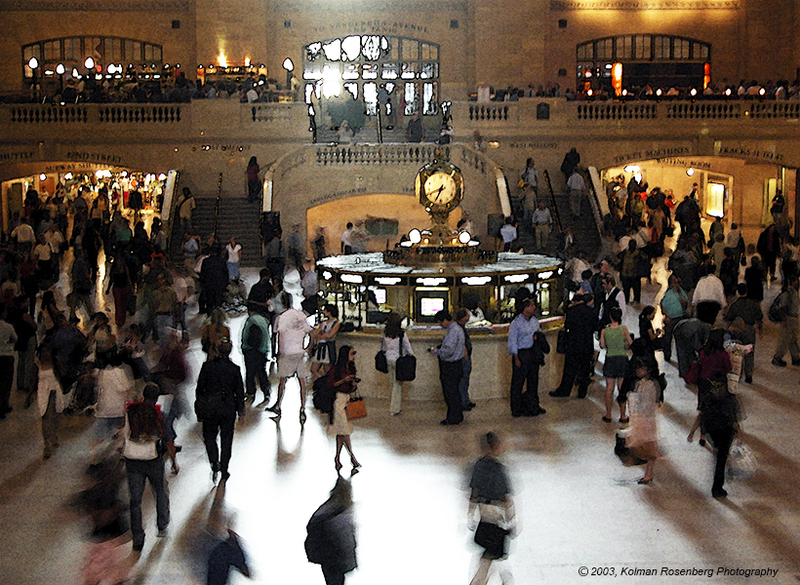 Grand Central Terminal is constantly abuzz with motion, so I wanted to convey that feeling. Secondly, I applied a slight watercolor filter to the scene, so it has a slight painterly effect. Like many treasures, Grand Central Terminal was at one time on the schedule to be demolished. It had fallen into disrepair and it was only the actions of concerned citizens and Jacqueline Kennedy that managed to save it! If ever in New York City, it is certainly a treasure worth seeing! This entry was posted in Uncategorized and tagged Grand Central, Grand Central Station, Grand Central Terminal, historic site, Manhattan, New York City, railroad, terminal, Train, treasure. Bookmark the permalink. Kolman, I’m making mental notes while enjoying this photograph. I think you added value to this photograph by your method. Thanks again Patricia! This photo is 10 years old now but I don’t get tired of it!